We use the Department for Educations Progress 8 to measure progress. This measures the actual attainment 8 score against an estimated attainment 8 score. The estimate is based on the pupils’ Key Stage 2 reading and maths scores combined. 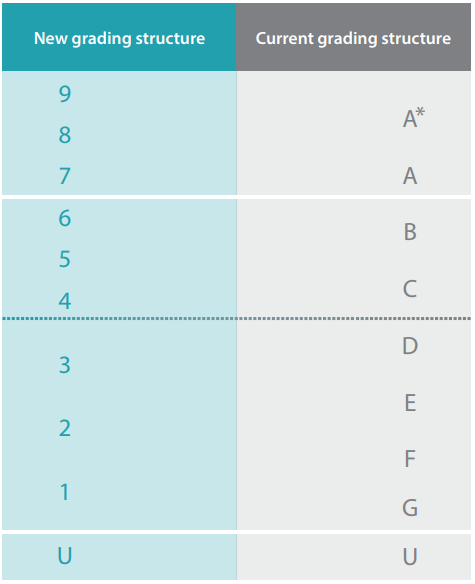 Attainment 8 is made up from Maths and English (Highest from English Language or Literature), the three highest Ebacc exam grades and the three highest non Ebacc subjects count. The non Ebacc bucket can contain English Language or Literature or remaining Ebacc qualifications. If a bucket/qualification is not filled it counts as zero. English and Maths are double weighted. It effectively becomes 10 buckets/qualifications. All qualifications have to be approved by Ofqual. English and Maths have to be the new reformed qualifications. In 2017 new points have been introduced. The system has been designed to accommodate the transitional two years when GCSEs are awarded in both grades and numbers. There is a significant difference in points that can be awarded. In 2018 it will go up to 90 for most pupils but be 89 (approx.) for pupils who have unreformed subjects. A pupil achieving E grades will have a lower attainment 8 outcome in 2017 form 2016. The outcomes for 2017 for reformed subjects were in line with 2016. Ofqual ensured that at G+/1+, C+/4+ and A+/7+ benchmarks the proportions achieving each based on prior attainment remained in line with 2016. Progress 8 is the difference between a pupils estimated Attainment 8 and actual Attainment 8 divided by 10 (English and Maths is double weighted). The Attainment 8 estimates are based on the Key Stage 2 fine level. In 2017 pupils took the Key Stage 2 in 2012 and the fine level is based on the average from their Reading and Maths Key Stage 2 Scores. This score is used to give attainment 8 estimates. In the above example Gillian’s Key Stage 2 score gave her an estimated attainment 8 of 59.92. She actually scored 67 points. The difference is then divided by 10. 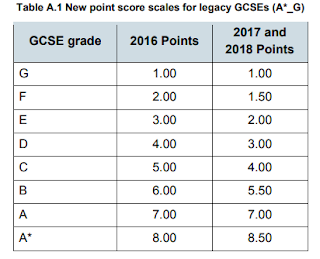 A progress 8 score of 0 is in line with national progress of pupils from a similar starting point. A score of +1 in 2016 represented progress on average for all the 8 subjects at one grade higher than expected. As shown on page 1 the scoring has changed and 1 point does not now represent a grade for non-reformed subjects. A pupil who achieved a B rather than a C scores 1.5 points, however a pupil who achieved an E rather than an F scores 0.5 points. This means that the impact of gaining a grade higher or lower at the top end is greater than at the lower end. 1. 2017 was the first of the Reformed GCSEs. This has made predictions difficult as it is a new syllabus with a new points system. In English the IGCSE was not approved by Ofqual, therefor over 200,000 leaners moved to the reformed GCSE from this qualification. 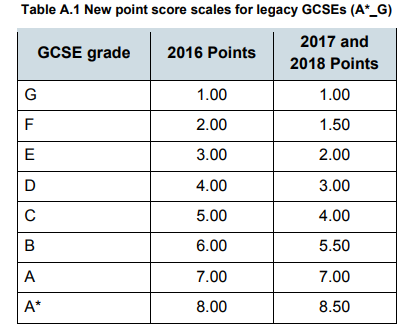 The vast majority moved to AQA who saw there entries double in 2017. They were busy. 2. To fit in line with Attainment 8 the number of entries for Science and Geography increased in 2017. This will means the number of Ebacc buckets populated has increased and will impact the estimates. 3. 2017 is the last year that Ofqual have approved the ECDL qualification. Ofsted have raised concerns about entering whole cohorts. Schools with Lower Prior attaining cohorts that have done this can add up to 0.2 to the progress 8 score. The issue is if you have not done this then your scores will go down. The Attainment 8 estimates are based on comparisons to others. We do not have the number of entries but in 2016 it was 90,000. 4. It is worth noting that in 2012 Key stage 2 scores were half a sub level higher than in 2011. This will also negatively impact any estimates calculated. 5. SISRA and 4Matrix have provided schools with estimates based on the results that they received from schools. These must be used with caution. Provisional attainment 8 estimates will be released at the end of September. 6. The Department for Education’s Floor target is -0.5. The Coasting score is -0.25, this is over a three year period.